Like attending a wedding on a beautiful Saturday afternoon in June instead of an indoor hockey game on a gray windy January day, the bells of Ranger shots clanging off the goalpost and crossbar rang out through the Garden and separated the Blueshirts from a sweep of their back-to-back series with the Carolina Hurricanes. 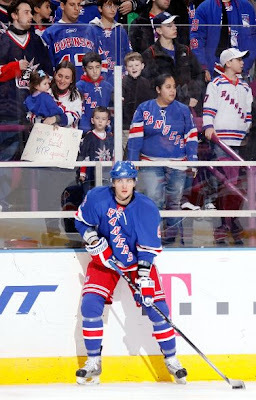 Fortunately, the Rangers escaped with a point in their 2-1 overtime loss. Even though the Rangers did get 3 out of a possible 4 points in the 2 games and played quite well in many facets, it was a disappointing result especially because they left another point on the table in a contest with the Eastern Conference cellar dweller that has allowed the most goals in the league. Official recap here. The Rangers had some stellar performances but no payoffs, yet again. Henrik Lundqvist in his 923rd consecutive start (so it seems) played solidly and was only beaten by 2 pucks he could not see due to traffic in front of the net. The core of the Rangers defense corps -- Staal, Del Zotto, Girardi and even Gilroy -- dominated the bright side for the Rangers. Marc Staal had a tremendous game overall by effectively nuetralizing his brother Eric Staal (doing his best Chris Drury impersonation on offense) and by confidently leading rushes up ice. He was the best Ranger out there. Michael Del Zotto played a solid all-around game by throwing his body around especially in the first period and playing well throughout the game. The only true defensive lapse occurred late in the 2nd period when after killing a Carolina power play, the Rangers could not get the puck out of their own end for a minute. Carolina converted with 46 seconds left -- another goal allowed in the last minute of a period, which has been a trademark of the team all year long. tradition of Ranger hockey heartbreak. Brandon Dubinsky buzzed around the ice and created several opportunities. 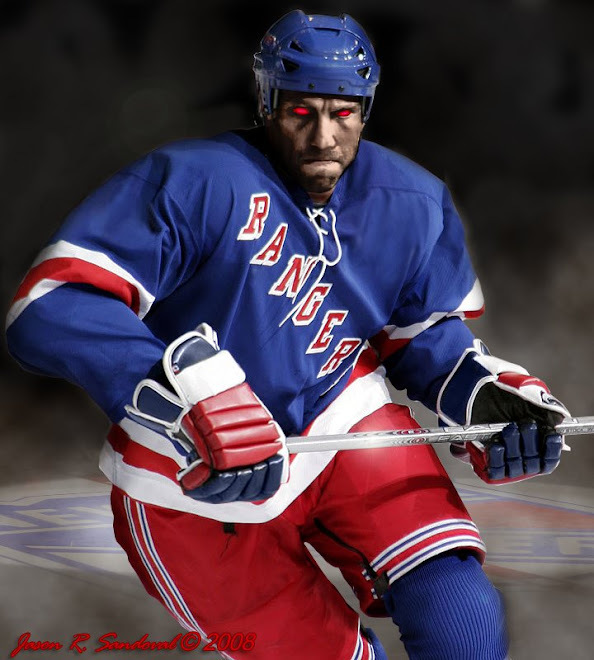 As with other Rangers, his inability to put the puck on net or shoot the puck proved fatal. Still, he has brought sufficient energy to replace Vaclav Prospal on the ice. Now only if the two were playing on the team at the same time, the Rangers might have something. Brian Boyle showed that perhaps his true skill is on the penalty kill as he was terrific several time using his body and mixing in some finesse to get the puck out of danger. 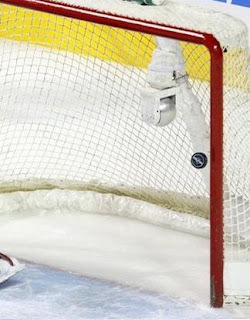 If not for those cursed goal posts, the Rangers may have won the game in a laugher. Hurricanes goalies Cam Ward was beaten cleanly 3 times by Anisimov, Gaborik (the post must be hurting from that shot this morning) and Callahan and saved by a crossbar on a Drury shot he deflected with his glove. But for a 1/2 inch or so, the Rangers win. But as of Saturday evening, Cam Ward was another in a long line of goalies the past 2 seasons who got a win because Fortune let them face the Rangers. Proving it is indeed better to be lucky than good, Ward got the first star of the game -- apparently, an inanimate object that made more game-saving saves was ineligible. Time for a musical interlude -- plea to the iron . . . . Since I heard that goal song of mine . . . . But the real killer of the game was not only the goal post's ability to save Cam Ward's goals against average but the Rangers' utter disarray and ineptitude during a 4 minute power play in the second period. They managed one shot on goal and perhaps 3 or 4 attempts including a Callahan laser that found iron not twine. Otherwise, it looked as if they were trying to practice North Carolina's old four-corner offense. Not surprisingly, shortly thereafter, within 3 minutes, Carolina scored to take a 1-0 lead into the final period. 27th represents 25% of the Rangers goals this season. 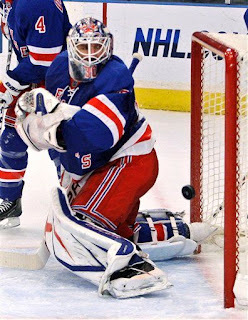 Although the OT goal was scored thanks in part to a communication and/or location mix-up by Girardi and Del Zotto, again the Rangers proved that they play with little or no margin of error of any kind by the defense or their goalie. This is not a formula for success and the cure falls all forwards whose name is not Marian Gaborik. So, at the halfway point of the season, the Rangers have 43 points. They are pitiful at home with an 8-10-3 mark including 1-5-3 in their last nine home games. Thanks to the Thrashers recent 8 game winless streak and Panthers 3 game skein, the Rangers are actually 8th in the Eastern conference. play with Matt Cullen and some bad defensive positioning. The Rangers are 0-4 in games decided in OT. But other than their penalty killing and power play prowess (both 5th in the league), they are mediocre. It is discouraging that the Rangers are in the middle of the pack in the standings when their special teams are so good. This demonstrates two things -- the Rangers are ordinary on offense when playing even-strength which prevents them from manufacturing either goals or power play opportunities. And whether the Rangers can get increased (and in some cases, any) and consistent scoring from Kotalik, Drury, Dubinsky, Higgins, and Callahan will dictate whether the Rangers will make the playoffs.